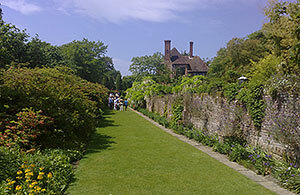 Sissinghust is one of the best known and most admired gardens in the world. This famous garden was developed from 1930 onwards by Vita Sackville-West and her husband Sir Harold Nicolson. The site one hosted a grand medieval moated manor house which fell into disrepair in the 18th century and all that remains today is the brick-built twin-turreted tower that lords over these magnificent gardens. 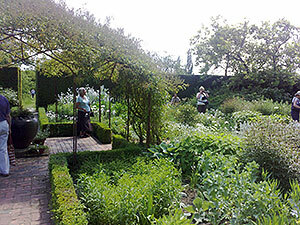 The gardens are of a similar design to Hidcote Manor, where a series of interlinked separate gardens rooms have been created, each with its own distinctive character. The most famous of these is the white garden, which is particularly spectacular in June. Its outline represents a miniature parterre with different sections given over principally to white and shades of grey. 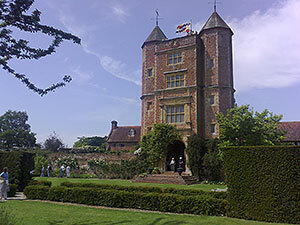 Sissinghurst is especially renowned for its extensive collection of old fashioned and shrub roses and the rose garden is among one of its most popular attractions. The cottage garden is another popular area, usually bursting with vibrant reds and oranges. Other areas include a long border packed with luxurious plantings of herbaceous perennials and specimen plants, an orchard and a charming herb garden in the warm south corner. In its heyday, Sissinghurst was a break from the formal straight lines of other important gardens of its time, where plants were allowed to spill out over the borders and wildflowers allowed to set seed. The garden provides all year round interest. In the spring visitors can stroll along the Lime Walk and enjoy its long borders filled with spring bulbs, grape hyacinths, tulips, narcissi, anemones and fritillaries. Beyond the moat walk, blooming with wallflowers in summer, is the Nuttery, originally a plantation of Kentish Cob Nuts, now under planted with mixed perennials. Now owned by the National Trust, Sissinghurst is open to the public throughout most of the year (April to Mid October) and is well worth visiting.